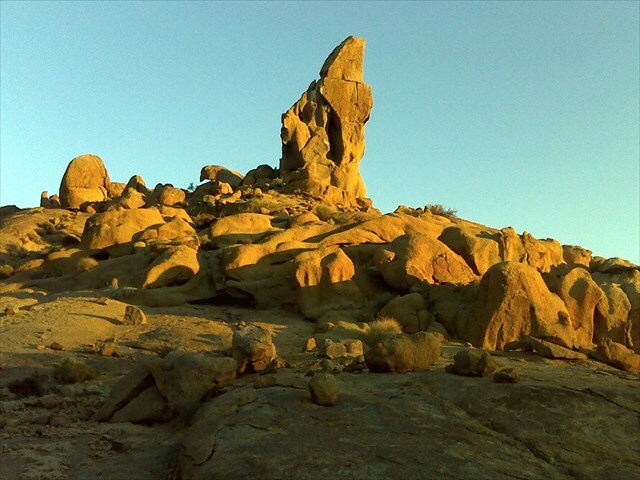 This earthcache is in the Richtersveld National Park. A daily conservation fee is payable or free with a valid Wild Card membership. The park is only accessible by means of a 4x4 vehicle, but vehicles with high clearances such as kombi’s and LDV’s do travel in the park. Sedan vehicles are not permitted. An Earth cache is a special type of Virtual Cache that is meant to be educational. Therefore to log a find you must demonstrate that you have learnt something from the site and experience. Send your answers to us in an email via our profile page. Any logs not accompanied by an email will be deleted. Q1. 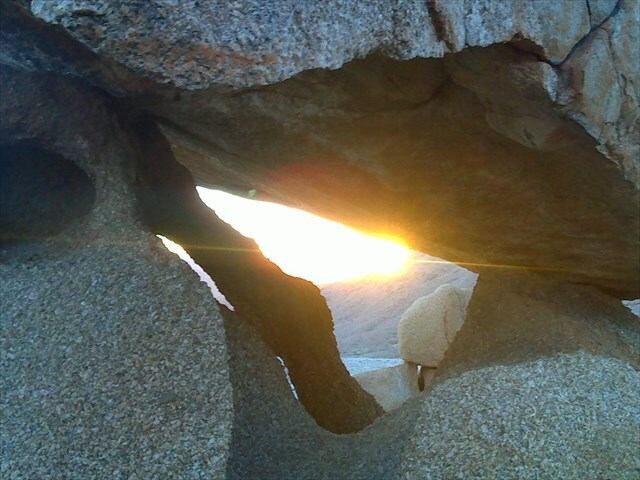 The published coordinates will bring you to an unusual rock formation. What is unique about it? Q2. What size is this “unique” feature (height and width)? Q3. How do you think this unique feature was formed? Q4. Describe this rock formation in terms of colour and texture. Q5. There is a signboard nearby pointing the way. What is on this signboard? Geologically the Richtersveld is regarded as one of the most interesting and visually stunning geological areas of Southern Africa. 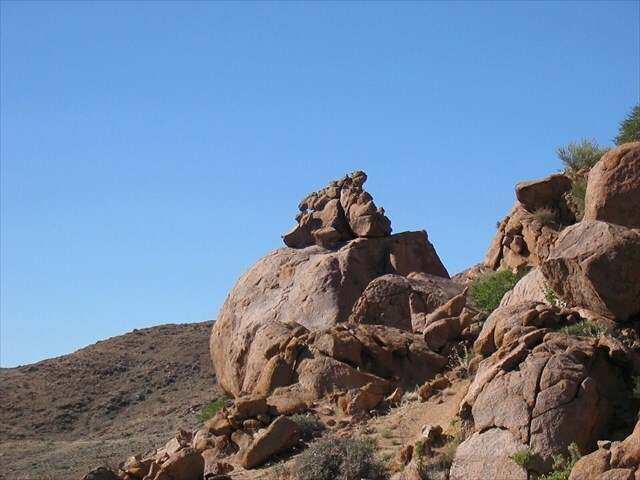 The Richtersveld has several geological units deposited over an enormous time span with rocks ranging in age from one to 2 000 million years old, almost half of the age of the Earth. The ancient geological forces which occurred in the Richtersveld are clearly evident - intense folding, buckling and fracturing as a result of uplifting, plate movements, and volcanic and glacial systems are on display in what can be described as an open-air museum throughout the Richtersveld Community Conservancy, most strikingly in the high cliff walls along the Orange River. 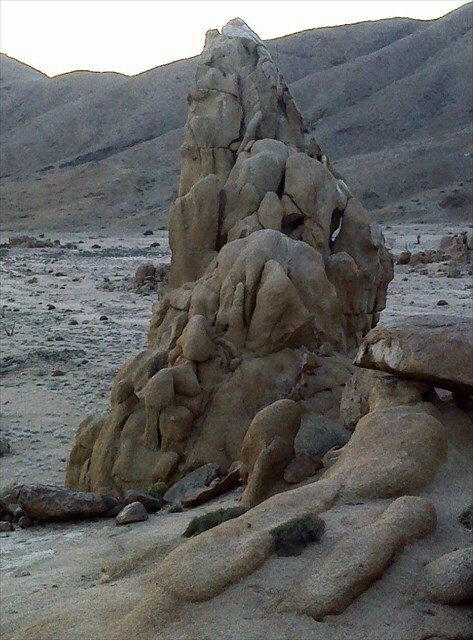 Numerous geological suites make up the Richtersveld landscape. 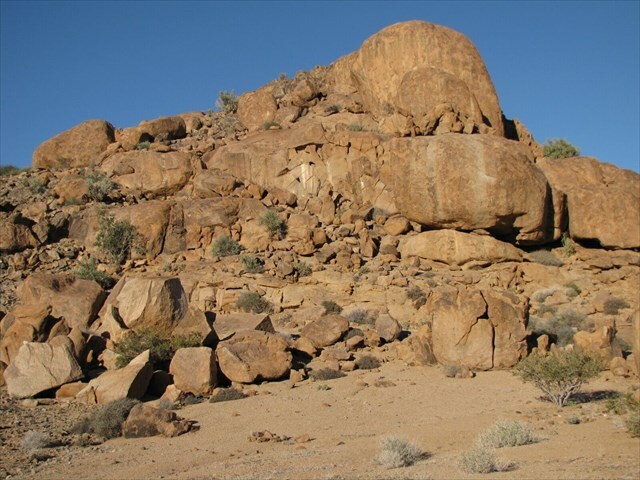 The volcanic rocks of the Orange River Group represent the oldest Richtersveld rocks at 1 996 million years in age. These are found in the Conservancy at places along the Orange River and in the Windvlakte Formation in the Fluorspar Valley and Black Face Mountain areas. 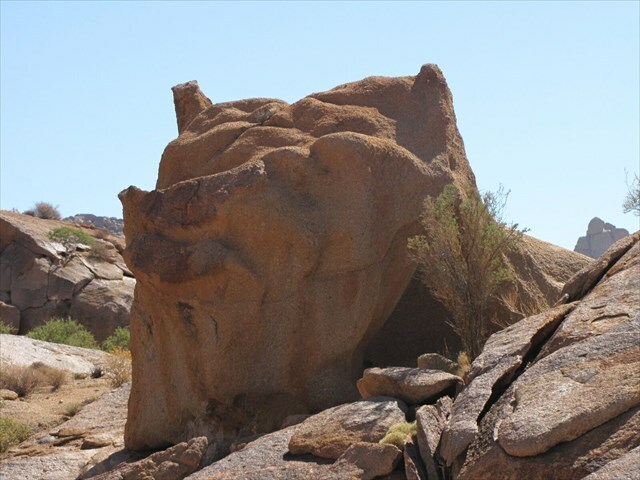 The Vioolsdrif Suite with rocks ageing between 1 900 and 1 731 million years intruded the Orange River Group and are represented in the Conservancy in the Rooiberg area as well as the remote lands in the north by the border of the Richtersveld National Park. These extrusive igneous rocks were created from intense pressures forcing molten lava up through the crust. 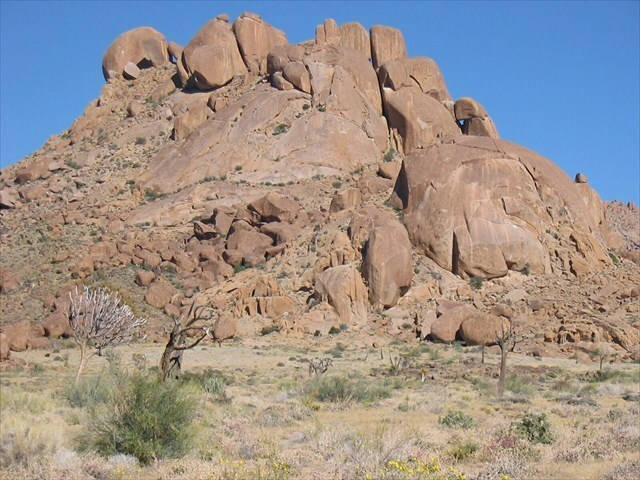 Granite, granite porphyry and syenite rocks of the Tatasberg complex (two plutons <deep bodies>) are intrusive into rocks of the Orange River group and of the Vioolsdrift suite. 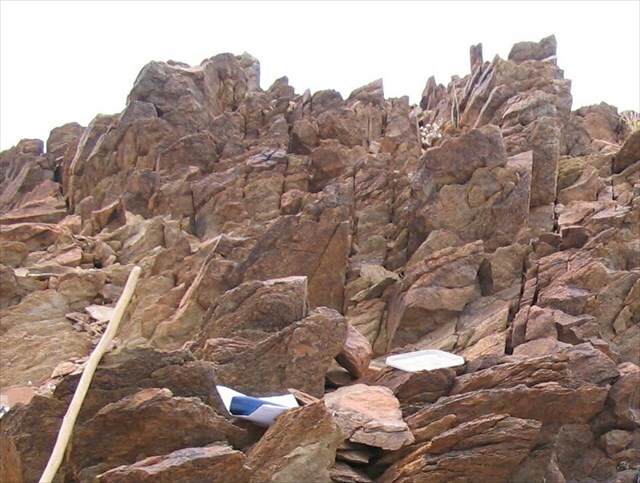 The next oldest group called the Richtersveld Suite (920 million years ago) is comprised of steep dome-shaped masses of granite and ring complexes and can be found in the area of Mt. Stewart in the eastern parts of the Conservancy along the Orange River. Also along this prominent north-south line is the unusual kilometre-wide Gannakouriep Suite, a range of black, dolerite (or diabase) dykes which were formed by upwelling magma intrusions between 870-540 million years ago. Dolerite (or diabase) is a mafic, holocrystalline, subvolcanic rock equivalent to volcanic basalt or plutonic gabbro. Dolerite dykes and sills are typically shallow intrusive bodies and often exhibit fine grained to aphanitic chilled margins which may contain tachykite (dark mafic glass). The Gariep Complex's (700 million years old) Hilda Suite and the Stinkfontein Formation comprise most of the western part of the Conservancy and the Stinkfontein Mountains which form the high central ‘spine’ of the Richtersveld that serves as a barrier between the cold fog deposits on the west and the drier areas to the east. These north-south running mountains are largely responsible for the climatic differentials and variety of habitat types in the Core Area. The high mountains trap moisture at their peaks giving rise to the high rates of endemism amongst the mountain flora, as well as creating a very different environment and flora on the eastern side extending to the Orange River. 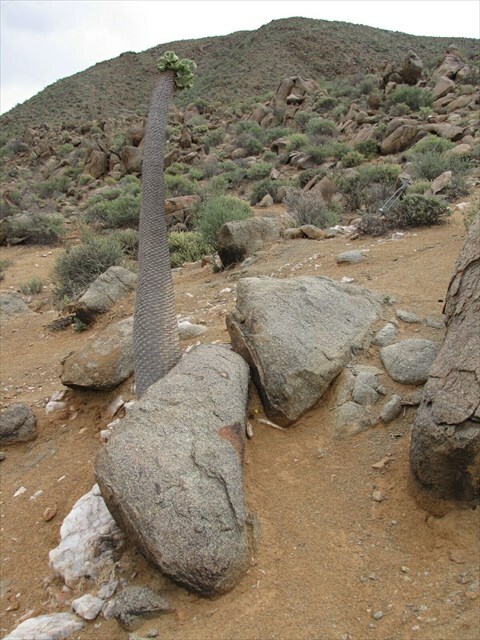 The highest mountain in the Richtersveld, Cornellsberg (1 377 metres) lies at the heart of the Stinkfontein Range and at the centre of the Conservancy. The Hilda Formation comprises limestone, dolomite, diamictite, feldspathic quartzite and phyllite. This heterogeneous mixture of rocks was probably deposited on a continental shelf. The Stinkfontein Formation represents the base of the Gariep Group and rests discordantly upon the Namaqualand Metamorphic Province. It comprises sandstone, flaggy quartzite, conglomerate, phyllite and interlayered lava and pyroclastic rocks. It probably represents a series of alluvial fans that merged together as sedimentation progressed. 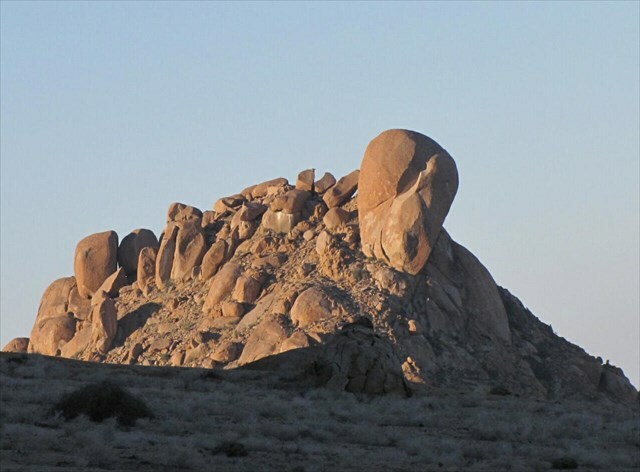 The Gariep Complex comprises a sequence of sedimentary and volcanic rocks which are accumulated in a basin that formed on rocks of the Namaqua Mobile Belt, the Orange River Group, the Vioolsdrift Suite and the Richtervfeld Intrusive Complex. This Supergroup is represented by a group of volcanic and sedimentary rocks that have accumulated in a geosynclinal trough (linear trough of subsidence of the Earth's crust, in which vast amounts of sediment accumulate) on the west coast of Africa. The Numees Formation follows discordantly upon the Hilda Formation. It comprises diamictite, shale and dolomite. Although the Holgat Formation is nowhere seen in contact with the Hilda Formation, it is thought to represent a deep-water facies of the latter. It comprises feldspathic schist and meta-greywacke. The Grootderm Formation comprises chlorite, schist, amphibolite, basic lave, breccia and tiff. It overlies a thrust plane that seperates it from the underlying Port Nolloth Group. The Gais Formation comprises dolomite and pyroclastic breccia. The Oranjemund Formation comprises meta-greywacke, phyllite, slate and schist. The younger rocks of the Nama Group (570 million years old), however, are perhaps the most dramatic of all with visible and intense folding on display in eastern part of the Conservancy and the Helskloof Provincial Game Reserve. The Nama Group is made up of subhorizontal sediments – basal quartzites overlain with limestone, shale and sandstone. The Nama Group was followed by the intrusion of the granitic Kuboos-Bremen Suite around 40 million years later. 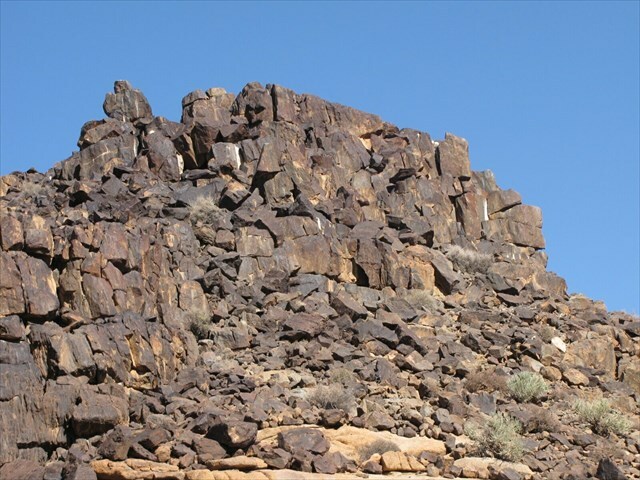 There was a subsequent period of inactivity, after which the Dwyka and Ecca Groups of the Karoo were deposited, approximately 270 and 250 million years ago respectively. 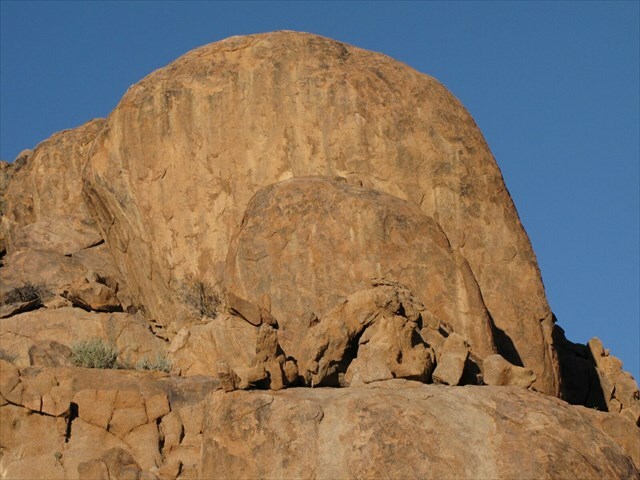 It is important to note the importance the geological formations have on the natural environment of the Conservancy. Not only have the range of geological formations created a wide variety of habitats and climate systems, but they have also resulted in an isolated environment protected on several sides by physical barriers. The northern and northwestern borders are the most obvious to the observer with the massive mountains of the Orange River Suite rising high from the floor of the land and serving as the northern and northwestern boundary to the Conservancy. These mountains are almost entirely impassible and have no roads. The Eastern boundary is also effectively sealed off by the high quartzite cliff walls on the Namibian side of the Orange River, making the shore along most of the Namibian side unreachable except by boat and uninhabitable by people. The Helskloof Provincial Reserve is also comprised of high cliffs, deep canyons and an expanse of black and inhospitable rock faces unfit for agriculture or human habitation. These geological factors insulate the Conservancy in many ways from encroachment by unsuitable land uses along its borders. Cyrnfr erzrzore gb rznvy lbhe nafjref.